Continental is a German automotive manufacturer founded in 1871, Continental offers safe, efficient, intelligent and affordable solutions for vehicles, machines, traffic and transport. In 2017, Continental generated sales of €40.5 billion and currently employs more than 235,473 people in 61 countries. Continental AG is fourth globally as the supplier of Automotive spare parts. The company is the Europe's second largest in the same industry. They manufacture and provide services over a wide range of automotive parts. The company differentiates itself by giving prior importance to the safety and comfort of the consumers. It ranks #234 in Forbes Top Multinational companies and has more than 235,000 employees globally as of January 2018. Continental’s vision is ‘Your Mobility, Your Freedom. Our Signature’. They are targeting zero accidents, intelligent and affordable mobility. Continental’s USP is the smart technology solutions for mobility and data mining for different markets that add value to the brand. 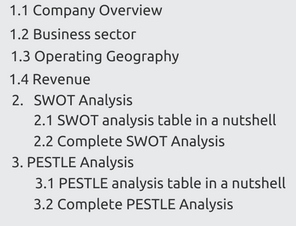 The SWOT analysis of Continental is presented below in a nutshell. 1. Strong presence in Europe with market leadership in some categories: The Automotive Systems division continues to maintain its number one market position in the hydraulic foundation passenger car brakes category. Europe is its biggest market and formed 29% share in 2017 sales. The company is the Europe's second largest in the same industry. They manufacture and provide services over a wide range of automotive parts. It has nearly 25% market share in Europe automotive component market. One in every three cars delivered in Europe are fit with Continental tires. 2. Highly developed R&D unit: In the year 2017, the group spent 3.1 billion euros on R&D which is around 7% of its sales. On April 12, 2017, continental opened a new research and development centre in San José in Silicon Valley, U.S.A. Up to 300 experts from all parts of the company will be able to work at the site on pioneering solutions for the sustainable mobility of the future. The proximity of their R&D centres to the customer base helps the group adapt to new requirements more swiftly. The projects are related to automated driving, electromobility, connectivity and mobility services. With the growth of software-based solutions’ demand, the group can tap the strategic location’s advantage which has new start-ups and consumer base seeking data processing of large amounts using artificial intelligence. 3. On path to be the market leader in fastest growing automotive technologies: The group is on the way of gaining market leadership in automotive technologies as it leverages its digitized portfolio which is the highest among peers like Goodyear, Hankook, etc. Its revenue pool surged by more than a trillion euros and the revenue from electrification, automated driving and holistic connectivity is expected to grow by 30% till 2025 from less than 3% in 2017. Continental is targeting 15% market share in this new business of system integration. Its ergonomic human-machine interface and optimization of information flow through integrated system components will complete its product portfolio and create another USP. It has already connected more than 30 million vehicles in 2017 and is targeting more than 250 million vehicles by 2020. It is also well positioned in diesel-related, HEV related and BEV related business with 160%, 160-360% and 400% relative value in 2017. 4. Specialized divisions for product differentiation: Continental Corp has two groups under its umbrella, Automotive group and the Rubber Group. Automotive group has The Chassis & Safety division for the production of smart systems for transport recorded 19.9% ROCE, Powertrain division for innovative and efficient powertrains 13.2% ROCE & the Interior division which handles information management and offers network solutions for automobiles 14.9% ROCE in 2017. The rubber group has a tire division which is its best-selling segment and due to superior grip of its tires and fuel efficiency 35% ROCE. The other division is ContiTech for smart solutions with for machine and plant engineering, mining, agriculture, the automotive industry, and for other important sectors 13% ROCE in 2017. The group has been consistently posting strong results in these segments which supported the strong financials. 5. Balanced sales distribution for cost effectiveness: The sustainable value creation by the group reflects the balanced sales distribution and customer portfolio. The cost effective production measures are used to manufacture in geographies where cost is least. Its OEM is at 72% and non-original OE is at 28% and in medium to long term will go upto 60% & 40% resp. This is in line with their strategy to optimize costs given the rise in a few raw materials. Automotive Group and the ContiTech division’s production and sales are balanced across regions. Economies of scale is realised in tire production with concentration in Europe, the U.S.A. and China which have more production and vehicle numbers. It helps n achieving more volume with low production costs. The tire division sales grew by 26% in FY 2017 because of the rich dealer network worldwide. 1. Increasing costs & reducing profitability: The EBITDA is decreasing over the years with increasing labour costs and other expenses as inferred from the P&L statement. EBITDA of Rubber group fell by 1.7% to €3,296.4 million in 2017. Even though the revenue of second quarter of 2017 has increased by 8% by Y-o-Y basis but the profits have decreased by 3 % whereas the capital expenditures have increased from 497 million euros in 2016 to 674 million euros up to June 2017. This was primarily due to increase in natural and synthetic rubber (which is important component of its Rubber Group) due to increase in crude oil prices, decrease in aluminium production due to supply cuts from source. It takes away the cost advantage that the group has over other international players due to close proximity to source. The company needs to produce or manufacture its product economically keep a check on its QCD and keep the corporate mission. It needs to check on its price of the products manufactured with the opposing products. 2. Highly dependent on Rubber manufacturing unit in terms of revenue generation: Rubber Group uses various types of natural rubber and synthetic rubber are used for the production of tires and industrial rubber products. Large quantities and direct purchasing of raw materials, their price movements, affect earnings of the Rubber Group’s Tire division. The Rubber manufacturing unit gave generated 5123.1 million euros of revenue which comprises of 25% of the total revenue. The doubling of natural rubber prices at the end of January 2017 due to the weather-related supply shortage. The price rise for the various raw materials led to considerable costs for Continental in 2017. The price burden was shifted to consumers but if raw material price fluctuation continues then its competitiveness and hence demand will be negatively affected and thereby earning. It could lead to plant closure and capacity loss as well. The PESTLE analysis of Continental is presented below in a nutshell. 1. Political Stability in most of the markets: The political stability of major markets is an opportunity for Continental AG to grow with minimal political tension. In addition to that, state support for eco-friendly products is an opportunity for the company to improve its products to satisfy or exceed environmental expectations and attain tax benefits. Political tensions between US and North Korea and in Syria heightened the uncertainty in these regions and led to a decline in stock markets worldwide. French elections instilled stability and sales grew by 6% with 5% growth in passenger cars. However, due to tax reform uncertainties, the US recorded a 12% dip in production of passenger and commercial cars which negatively affected tire demand. Uncertainties can increase trade barriers and affect earnings. 2. Trade protectionist policies of Trump administration: Increased protectionism policies impacts global trade and more often than not these are influenced by political factors and issues. Continental AG being a German company may find difficult market conditions for operating in the U.S as new regulations are likely to be introduced affecting foreign companies. Trump administration has already withdrawn from Trans-Pacific Partnership trade agreement and is expected to take many more administrative changes to trade deals and partnerships. 3. Government support for Eco-friendly products: Due to global warming and other adverse environmental issues, most of the countries have become more committed towards environmental conservation and keeping carbon emission in check which directly impacts the automotive industry. Especially after the “Paris Environmental Agreement”, governments have incentivised eco-friendly products. The overall government grants were €12.9 million in 2017. There was an increase in tax holidays and incentives which contributed to the increased EBITDA by 10%. Such incentives increase net income and create more in-house funds and assets which can be used for further expansions. 1. Increasing popularity of e-commerce in tyre segment: The rising internet penetration has increased use of e-commerce channels and spending & it will soon become primary sales channels. Different categories of tires cost different which e-commerce platforms compare easily and make decision making easier. The global online tire industry is expected to grow by 7% CAGR in the forthcoming 5 years. The growth of automobiles, prominently passenger cars, replacement segments and two-wheelers are also increasing the sale of tires online. In 2016 around 6% tires in the US were sold through online channels. Continental AG has the opportunity to improve its e-commerce capabilities or to exploit third-party e-commerce service providers for sales of some of its products, such as spare parts these platforms have a larger consumer base. 2. Change in tire buying habits: Demographics have a significant impact on tire industry. Young consumers looks for value proposition instead of brand when they buy tires. The buying habits depend on price, brand, longevity of tire, maintenance and safety. Continental offers tires in various price brackets, all with high safety standards which makes its tires a preferred choice across different segments. The buyers of ultrahigh performance vehicles are young and status-oriented which boosts the premium tire sales. However, in the US, median household incomes for the millennial was 20 percent lower than baby boomers at the same stages in life in 2017. This can lead to slump in sales as price becomes the deciding factor. As per a 2017 survey, 38% of Americans bought the same tires that were already on the vehicle, 31% choose the best price and 31% go by the dealers recommendations. Brand affects tire choice for 1 in every 3 buyers (36%). Thus, right pricing and Continental’s brand can make it the market leader. 1. Digitisation of business processes: Most of the business processes across industries have been digitised which makes the supply chain and information flow more efficient. Two-thirds of the value of incoming orders in the Automotive Group Electronics is electronics in vehicles as well as sensors, actuators and software programs. The group is a pioneer in vehicle digitalisation as it supplies affordable and quality technologies. The advanced driver assistance systems contributed €1.6 billion in FY 2017. Around 30 million vehicles have been installed with this technology and Continental aims to achieve share of roughly 10 percent by 2020 in this segment due to technological balance with nearly 10% or more technologies in growth phase. 2. New business opportunities due to emerging automotive trends: The automated driving market is expected to grow to € 35 billion & holistic connectivity to grow to € 80 billion. With its most digitised portfolio in supply sector, Continental can become market leader in the segment. Its 3 layer model will roll out sensors, electronics software integration and software electronics. This entire market for automated driving will be worth €35 billion by 2025. Continental aims to capture growing demand for urban mobility by becoming a full time supplier by offering driving intelligence, camera, radar, lidar sensors through its own self driving car project Cube. Addition of new holistic connections like value added mobility services & integration of components and functions to superior systems at lower costs will increase revenue and profitability. 3. Prevalence of fibre network: Optic Fiber is fit for giving rates up to a few Gbps (Gigabit every second) and can support various gadgets at one go even to homes – a quality that is as yet a fantastical thought for Broadband working on older technologies like copper wire. Optic Fiber is intended for more transfer speed and higher rates. In essence, Optic Fibre refers to the medium and the technology associated with the transmission of information as light pulses along a fibre made of glass. Fundamentally, Optic Fiber alludes to the medium and the technology related with the transmission of data as light pulses along a fiber made of glass. Since the speed of light is an astonishing 300,000 Kms/sec, Optic Fiber goes about as a stunning medium of transmission. This feature is the basis of Optic Fiber communications, where it permits transmission over longer distances and at higher bandwidths (information rates) than copper wire cables. The benefits over Copper are scalability, high speed, multiple users & devices, broad bandwidth, low attenuation loss, electrical insulation and information security. Bridgestone, Goodyear, Michelin, Hankook, Pirelli, Sumitomo, Yokohama. 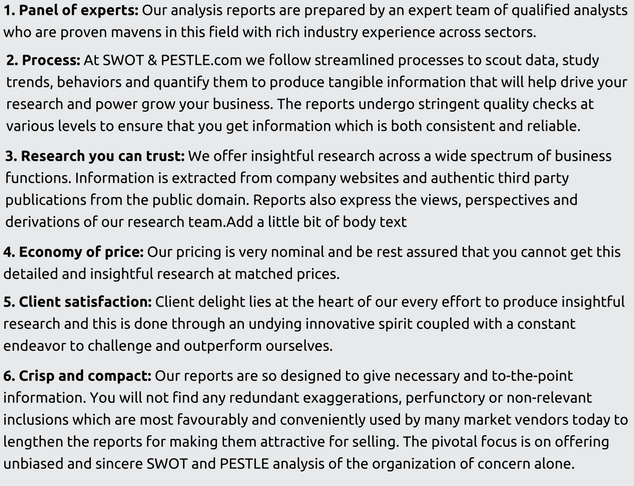 Continental SWOT and PESTLE analysis has been conducted by Kanupriya Sheopuri and reviewed by senior analysts from Barakaat Consulting. 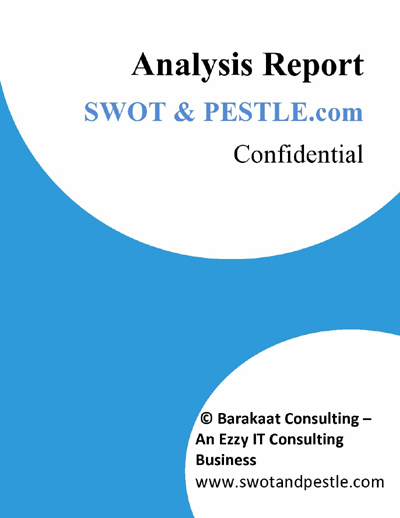 Copyright of Airbus SWOT and PESTLE Analysis is the property of Barakaat Consulting. Please refer to the Terms and Conditions and Disclaimer for usage guidelines.